Haegue Yang, Hardware Store Collage – Saturn QLED TVs #1, 2017. Hardware store catalogs, Chromolux paper, frame, 71.2 x 51.2 x 2 cm. Galerie Chantal Crousel is pleased to present Haegue Yang’s third solo exhibition, Quasi-ESP, after Ajar (2012, La Douane) and Ovals and Circles (2013). Quasi-ESP evolved around aspects of our immanent environment, a hybrid of the natural and the technological as well as whatever else can be counted as belonging within. Taking as starting points two groups of works, the “Lacquer Paintings” and the “Hardware Store Collages” (ongoing since 1994), Yang attempts to implant a hybrid or an oscillating view between seemingly different phenomena in Quasi-ESP. While both groups have been steady studio practices, Quasi-ESP demonstrates their renewed state through a change of materiality and a shift from the topics they are usually associated with. The “Lacquer Paintings” series curiously echoes the natural patterns used for “Hardware Store Collages.” Collected from different locations such as Mexico City and her Berlin studio garden and around it, vegetation is sealed under layers of lacquer and then air-dried outside so that natural influences, such as dirt, dust, rain drops and insects are imprinted onto the slow-drying surface. In contrast to previous “Lacquer Paintings” with paper collages, the current ones have a deliberate reference to botanical studies. Unlike the previous “Hardware Store Collages” that contained items from regular hardware shop catalogs, the new production from 2017 holds motifs from digital electronics stores catalogs. 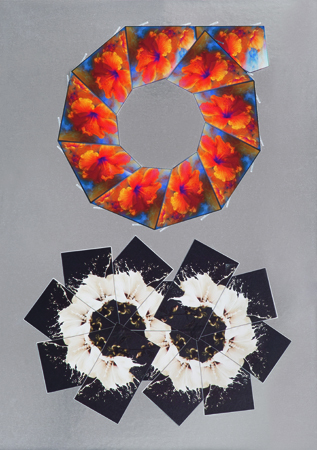 Cutouts of flat TV screens placed in a circle and S-shape contain natural flower images boasting about the crystalline resolution of the devices. Meanwhile, drones, headphones, and cameras hint at how they play with us on a daily basis. Nevertheless, when it comes to composing and selecting patterns in this collage series, DIY remains the guiding principle. Supported by these two axes of image-based work, the freestanding and suspended sculptures inhabit the gallery space. Known as The Intermediates (ongoing since 2015), they were originally drawn out from a rather common juxtaposition of modern versus folk. With each seminal stem generating a critical reading of contemporary duality or complexity, the sculptures have now lost their volume and become less anthropomorphic. Suspended and draping down from the ceiling, some have even evolved into creatures with tentacles, building an environment of an urban jungle. The freestanding pieces are in fact nothing but spheres carrying something incongruent. Swaying Television Ball (2017) carries a two-sided screen, with a frozen imagery of electronics devices and lenticular foil. Adorned with numerous industrial vents all around, Psychic Turbine Vent Ball (2017) appears to be hysterically hyperventilating. Faceted Dancing Mask (2017) is a sculpture that continues from a work cycle frequently nicknamed “Furniture Sculptures” and originates from the artist’s interest in domesticity, previously often manifested as shaped walls with tri- or angular cuts intended to articulate and filter both space and views. The front side is covered with lenticular foil; the other side remains unclad. Pierced by light, a suggestive face hidden in Faceted Dancing Mask emerges from a shimmering geometry. With attached handles and casters that imply a “dance,” the artist’s exploration of domesticity takes a step beyond the shift from wall to object. As a stage prop or movable backdrop, Faceted Dancing Mask becomes a three-dimensional object of exuberance. Yang has continuously attempted deviations within her existing cycle of works, and they have been significant in injecting a decisive sense of willful inconsistency into the accumulation of her own logic. Quasi-ESP presents a unique set up for deviations born out of active self-negation. According to Yang, deviations contribute to a valuable level of maturity, characterized by rebellion against her own establishment of existing logics and purposes. Leaning on her willful whim and inconsistency, pseudoscience is another part of Yang’s corpus of work. ESP (extrasensory perception, also known as sixth sense or second sight) refers to the sensing of information by means outside of one’s normal sensory capability and includes psychic abilities such as intuition and telepathy. Similarly, “extrasensorial perception” signifies Yang’s continuous endeavor to unlearn and dismantle, exploring how a deliberate lack of proof offers the most constructive form of self-challenge and communication for humankind in nature. Quasi-ESP is a schematic diversion of Yang’s oeuvre. Like a talisman, it interlaces visual contexts that are simultaneously recognizable and unintelligible.